The BMW R100R is a BMW standard type motorcycle. BMW DOES things differently "Germanly" and always has. It I puts panniers and shaft drive and heated grips on its "sports" bikes while everyone else is content with clip-ons. It uses an engine so old it was eligible to fight in the war, yet leads the way in fuel injection, ABS, emissions control, spares back-up, aftersales and other stuff that misses the headlines, but counts. The R100R, though, sets new standards in BMW oddness. It's a retro bike, the factory's first official crack at tapping into the torrent of nostalgia exposed last year by Kawasaki's Zephyrs. Kawasaki had presumably first taken a look at what it had — a stable of 16-valve liquid-cooled multis the technological envy of the world; chassis which joyfully extended the pleasure zone; an image of bright green, mean speed and hedonistic power—and worked back from there. The development clock was rewound a decade and out popped Zephyrs. So what did BMW do? It found some rounded-off valve covers trendy some 40 years ago — good start — but then furnished their new old timer with Japanese Showa suspension (a first) and eight Brembo pistons biting on a pair of floating discs (a radical departure). There are also 40mm Bing carbs, an emissions afterburning circuit, Paralever and a socket into which sophisticated electronic diagnostic equipment can be plugged. Out popped the R100R; the most advanced boxer-powered BMW in its 69 year history. Result: future retro? Something strange at any rate. Unofficially, all the horizontally opposed flat-twins (the Rs, aka boxers) are retro bikes anyway. Someone needed to say it out loud, that's all, which, with a liquid-cooled four-valve flat-twin due to launch next year, BMW can now do — cashing in on the stampede for modern classics in the process. There is, however, more to the R100R than a junked fairing and wire wheels. At 20 paces it's a random bitsa, at ten it's a R100GS trailie wearing street running gear and chrome. Not quite Supermotard but not full-blown retro either. That monolith beneath the tank is 980cc of Paris-Dakar inspired GS motor and five-speed gearbox. It gets GS big-bore carbs (other street Rs have 32mm Bings) and a smidgen more torque than the R100RS/RT — 60 snoozey bhp at 6500rpm, 56 fat lb.ft at just 3750rpm. The double-loop steel frame is GS, too: same laid-back wheelbase (longer than street Rs), same trailie rake and trail but with 18 and 17 inch wheels, road suspension and narrow bars (because the suffix R is for "road"). The forks, so often too long and soft on BMWs, are not only Japanese but have recalculated spring and damping rates over much reduced travel 135mm compared to the R100RS' 175mm. The rear unit has a longer than normal stroke but is adjustable for rebound damping as well as preload. GS/K1 Paralever, the double-jointed swing-arm/drive shaft which effectively reduces torque-induced pitching, finds its way onto a pure-roads R for the first time. It has the lowest of all BMW seat heights and only the plain R80 weighs less fuelled up — and that hasn't a capacious 24 litre tank swiped from a GS and given a golden oldie amethyst paint job. Retro-trailie-bitsa then, but with carefully selected bits which, assembled into an R100R, should stimulate a variety of tastes. BMW describes it as a classic-look road version of the R100GS which will appeal to "the young beginner and somewhat older but young-at-heart-rider re-entering the motorcycle scene...and the growing group of female riders...". You know, everyone. Everyone who's never ridden a normal bike. By 'normal' I now mean Japanese bikes in general. 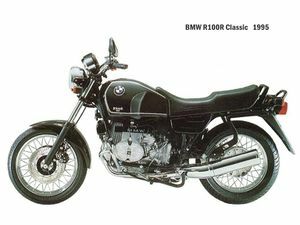 Before discovering the real R100R you have to cut through the usual hatful of BMW boxer idiosyncrasies — unbelievable oddness — which, over the early miles, so dominate the experience, riders returning from a quick spin are often left completely bemused. In my case re-familiarization took three days, during which time the R100R came close, damn close, to being dumped in the River Nene and good riddance. As usual it started with the infamous hinged key. It doesn't do anything bar trap all the others, jam halfway and scratch the console. Getting the key in is a one minute operation and is not funny. Then I remembered there's a spare. It's indistinguishable from the pannier key which always goes in first — it turns through the parking lights OK but fails at the last hurdle. Still, 30 seconds is half a minute saved and half a pint less sweat under the collar. And bang go two paragraphs, on a key. On the road, finally, the R's performance is dictated not by normal parameters such as power and handling but by how well the rider copes with the catastrophic switchgear and bizarre controls. The l'£ twist throttle is heavy, the brake and clutch levers stubby and of Teutonically wide span. Reaching beneath the right console for the right winker while going for the lever re-tweaked a wrist muscle I didn't know existed before BMWs came into my life. Going for the left one sounded the very honkable horn but only occasionally lit any bulbs. At best the re-familiarization period is undignified, at worst it's dangerous: too much concentration is spent on riding trivia in the face of oncoming Volvos. Then there's feet. The good news is they stay warm, tucked-in behind those protuberances known to retro-techno' freaks as cylinders. The bad is that the R100R sits you upright with feet foward and toes butting up against inlet tracts, carbs and other clutter. The right protuberance lies further back than the left which means the right foot does, too, in a unique and, in fairness, stupid asymmetric riding position. Pouncey on-toes riding is one solution. The other is to hold your ground but that brings unwanted sporadic upshifts (usually into neutral) c/o of a gear lever that's two inches too tight to the peg. Effectively, the rear drum brake doesn't exist: its pedal's stashed away between carb and peg in a gap so small and inboard it's nearly impossible to use safely. There's the get-off, lean-the-bike, swing-to-earth sidestand which should have gone out with the Commando. The main requires a grab handle that isn't virtually flush with its sidepanel. The above took three days either to conquer, come to terms with or endure. Some is wrong, more is simply Another Way, but all of it detracts from a basically decent bike. As the days rolled by, as always happens with me and boxers, my hate mellowed into disinterest into respect. Miles on boxers are always well rewarded. The engine and its drivetrain crave affection. Once its been given max' choke and seven or 16 protracted blasts on the starter (the battery is indefatigable) it slogs away in its frame, like all good twins should. It chuffs dry and tappety, pulling to the right in reaction to its shaft and flywheel but now fails to squat on the tarmac like those venerable pre-Paralever police BMs. Accelerating from tickover (which vanished after speed testing) brings a lumpy judder, then a brief vibration at 3000rpm before moving into its calmer waters. Before 4000rpm are showing on an excru-tiatingly slow tacho, torque has peaked and begun to drift slowly downwards as power climbs steadily towards 6500rpm. The tachometer zones are clearly defined: 1500rpm to 3500rpm: rough and gutsy urban punch; 3500 to 4500: lusty and smooth and where the tacho gravitates to on sub-75mph twisties; 4500 to 6000: same eager acceleration but with charm disappearing in direct proportion to rising revs, now droning like a DC-10; 6000 to 6500: noisy, should have shortshifted ages ago but there's a Golf ahead that demands a seeing to and power's still flowing; 6500 to deep into the red: shouldn't be doing this, pegs and bars are beginning to tingle, it's getting hot, the oil-cooler seems to be obscured by the mudguard, it's undergeared, my arms, neck and stomach muscles are indeed enjoying a good work-out. It'll hold 90mph (about 5500rpm in top) anytime. Or blast onwards, still pulling at 100, to big speeds if you enjoy playing parachutes. Geared up from the GS it's still theoretically undergeared but, because approximately no-one wants to be beaten-up by a constant 125mph headwind, a 116mph top speed at a valve-bouncing 8000 suffices. Revs and redlines just aren't its bag. It's a lazy old carthorse that will break into a gallop only if it's bullied. Response is suitably languid it likes a squirt of throttle and second-third-fourth shortshifts, which save a second bite at the throttle and drop it back into the lust zone. The box is lazy too — slow and sometimes stiff with a long throw — while the cable clutch (as opposed to the clutch lever) is light but barely breaks drive. Try booting it up one on falling revs and you'll probably fail; get the revs wrong on a downchange and the back end hops about. Neutral is difficult for the same reason, third goes missing, yet...what a great gearbox. It's fun, erm, a real rider's box. Don't ask, it just is. The effect that lot has on the rest of the bike is boxer legend. Everything from the seat, which cushions and supports like a trooper, to the fork's and rear shock's early movement is soft and squidgey. An attacked throttle followed by an upshift invites an exchange between front and rear suspension. As the throttle's backed off, the shock unloads onto the forks which do a little shimmy before sending another message rearwards. On slow turns, like roundabouts, a snatched handful can pull the bike up and offline on lefts, or make it fall into the curb on rights. Back off mid-corner with the bars held loosely and they'll try to shake themselves free of that dreadful switchgear. Blip the throttle on the way into second gear turns and the torque reaction nudges you sideways. Unlike the keys and switchgear, this isn't annoying it's genuine character and holly enjoyable. But it does mean that steering accuracy is hardly its forte. Understeer, oversteer and, above 80mph, straining arms make general aiming the order of the day. It bowls along on its trailie geometry — stable (so long as the bars aren't held in a death grip), feeling just like big trailies do with much reduced leverage because of those narrow bars. Speed steering is obviously slow, real underwater biking, and takes enough effort to keep you warm in winter. The trick on sweepers is to brake early then to turn on a constant or gradually opening throttle. That way it stays neutral enough and vice free —- ask any copper the next time you're pulled. The suspension, much improved on the last R100RT I rode, is built primarily for comfort at legal speed. It's a set up that cossets its rider without bottoming out, that maintains control without excelling. It flattens Farmer Palmer's bumpy B-roads (so long as you're pottering), has no limits on l00mph sweepers (so long as they've been recently steam-rollered) — it's as good as its road. It asks you to be gentle with it, to sweep rather than scratch. That was no hardship either. Using the lump's low center of gravity to roll around those steep-walled and skinny Metzelers was like riding a Weeble that won't fall down. The steering lock is exceptionally useful (feet-up one lane U-turns), I could travel in comfort for 170 miles before reserve, and the whole semi-trailie, semi-retro idea began to gel. Furthermore, I got well into R100R style riding, what the police call "making good progress", and reached home as ruddy faced and refreshed as I did on the last RC30.1 stayed warm, if not dry, in snow via its two-heat grips — like a hot bath — while the engine looked after my legs. Plonking tiresome rucksacks in the boot and a happy pillion on the back (which slowed performance to that of a hot-hatch) actually damped the suspension and gave more feedback from the faultless but rather isolated Metzelers. I was in danger of becoming a convert. The one flaw in this riding technique is that whatever you do on this bike requires big handfuls of everything (throttle, clutch, steering) but a gentle touch. Compared to a flyweight Jap' which responds to microscopic input, those levers and controls are brutish, and the brakes are no exception. The twin disc four-piston Brembos are very powerful by boxer standards (the R100GS has one twin-piston caliper) but their potential hides behind a lever that's easy to use with two fingers but really needs four. The span is too wide with much of the lever action not even getting pad to disc. When at last they bite there's more front-end dive than stopping and the wheel pulls in whatever direction it's pointing. The faster your speed, the better the brake/fork combination becomes (best on a BMW yet in fact) but coming to standstill is often a messy business. Dive, rebound, lurch, much paddling and bashing of shins on protuberances. The rest of the good kit is very good. Mirrors distinguish Skoda from squad car at all revs; the headlight melts Shellgrip (but needs adjusting with even the most undernourished of passengers); the console is a bit placcy but ergonomically pure; the panniers only leak a tiny trickle; and the toolkit, bulb kit, puncture kit...everyone knows about that stuff. Tragically, though, road salt rubbished the alloys almost overnight. At 900 miles, a bike that hadn't even been launched to the public it was so new, looked a hard year old. And it wouldn't tickover anymore. Nor would it start in the mornings, not since Bruntingthorpe's test strip where an R80GS also went rough and dozens of japanese bikes in between didn't. So there's a bundle of unanswered question marks there, but the fundamentals I'm sure of. Best boxer? Yes. Prefer it to a Kl? Yes. Good value? Yes, relatively speaking. Would I swap it for two packs of something more normal? Yes, but ask me the same question this time next decade when I'm older and wiser and BMW has had a rethink about its keys, switchgear, controls, side-stand and finish. When BMWs are a little less different. This page was last edited on 28 November 2010, at 05:34.